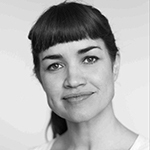 Rachel is an actor, artist, theatre maker and body worker who has been exploring somatic practice as a tool in her performance and healing work for most of her professional life. She facilitates workshops for adults interested in unlocking their dormant creative potential, developing physical presence and growing a more robust relationship with fear. She is particularly interested in the potential of play, instinct, imagination and creative agency to transform our experience of life. Runs a busy private practice as a deep tissue body worker, Reiki Master and healer. 15+ years facilitating workshops on improvisation, developing presence, embodiment, sense perception and freeing creative expression. Improvisation practitioner, facilitator and original company founder of The Maydays. Trained with Second City Chicago, Susan Messing etc. 14 years of classical ballet training. 3+ years performing arts movement training in many modalities including Feldenkrias, Aikido, Alexander Technique, Contact Improvisation, Suzuki and Butoh. 20+ years’ yoga and meditation practice.